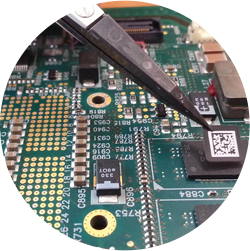 CCL Design Israel’s Laser labels offer a high durability identification solution for PCB marking (LML) and for other harsh environments applications, requiring supreme readability without affecting the labels surface. CCL Design Israel is able to combine the advantage of labels with the durability and efficiency of direct laser marking into one solution. Polyimide Laser Labels – A special labels with high opacity topcoat designed to withstands lead free soldering process. The labels can be marked and cut by laser and have pressure sensitive acrylic adhesive, especially designed for low surface energy applications. General Laser labels – High durable labels, including Tesa labels, suitable for indoor and outdoor applications. The labels are scratch, chemical and water resistant. These materials offer tamper evident capabilities as they are very difficult to peel intact from most surfaces. CCL Design Israel welcomes any challenge and will gladly tailor custom-made solution to your laser labels needs.